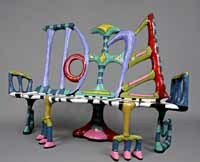 Description: Original fiberglass sculpture, steel base. Description: Elephants always remember. original fiberglass sculpture. Description: Fiberglass, concrete, ceramic and steel-4 directions.